On our first day (a Tuesday), we weren't able to get into our room for about five hours after we arrived, so we got lunch at Apple's Eye and took a walk around the bay as we tried to pass the time. 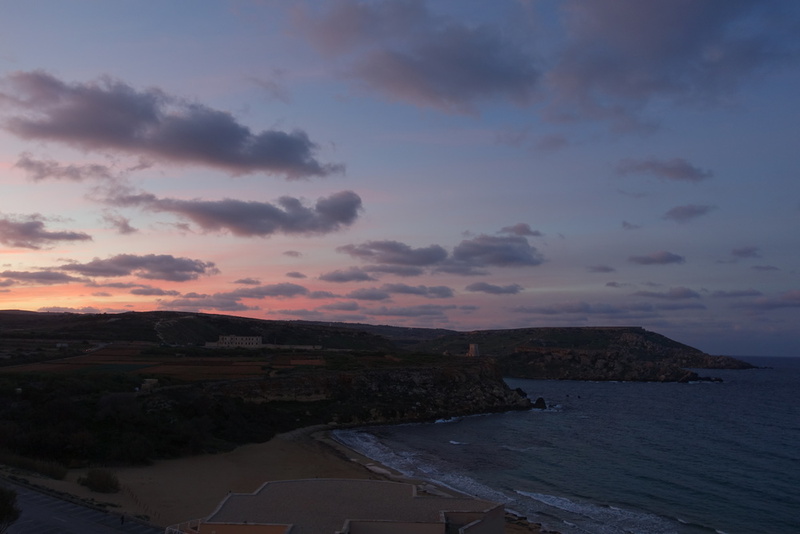 In the evening, we enjoyed watching our first Maltese sunset from our room. It did not disappoint. 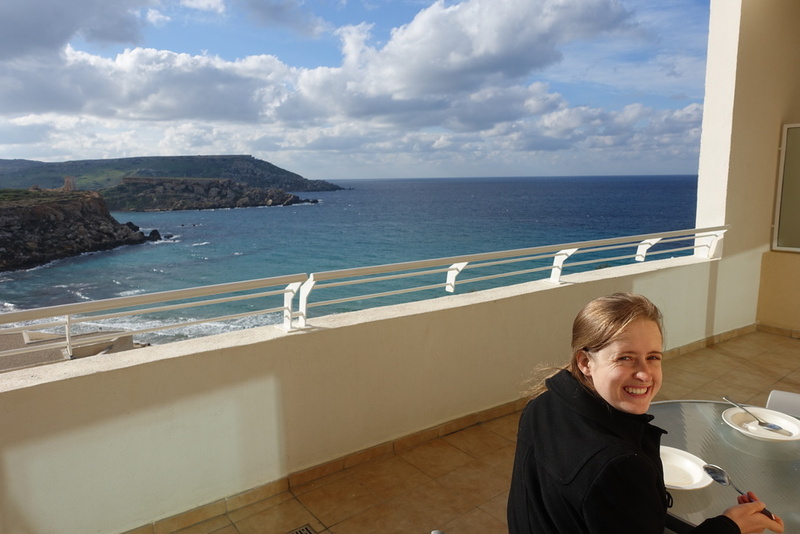 On our second day in Malta, our priority was getting to a grocery store! We tried to do this the previous day, but having to wait for our room so long (and they made us think it would just be one more hour...and then just one more...and so on) and the fact that most all grocery stores on the island close by 7pm kept us in until the next day. Thus, we woke up early enough on Wednesday to see the sunrise, motivated to get to a grocery store, stocked up on provisions for the week, had a late breakfast on the porch, and then spent the afternoon hiking on a path around three bays near the resort. 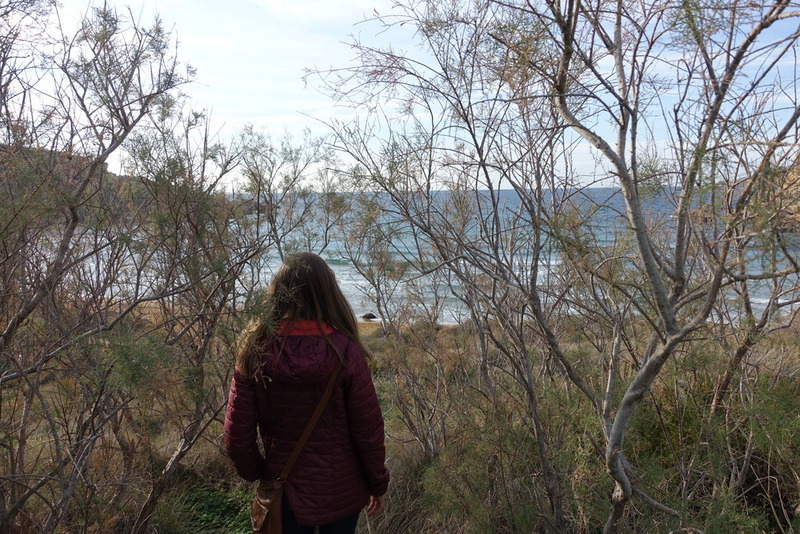 We started out taking the same path we took the day before, and then just followed it as it continued along the edge of the other bays - Golden Bay first, Ghajn Tuffieha second, and finally, Gnejna Bay. 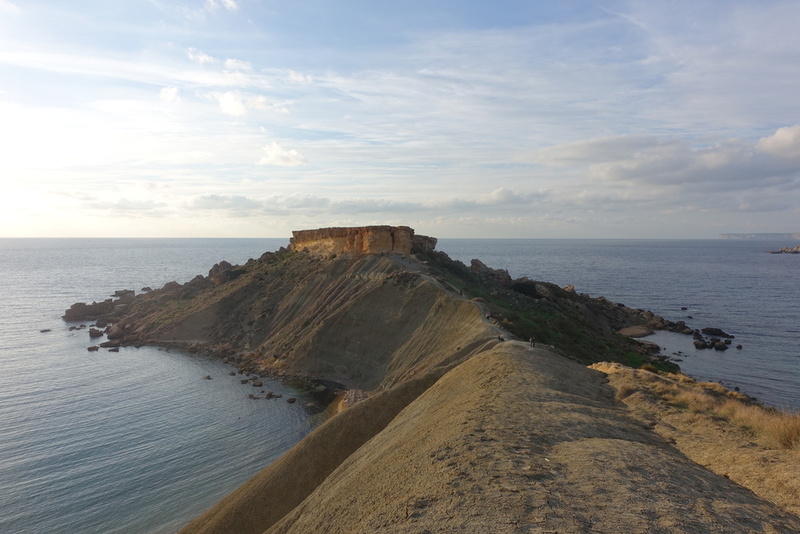 We got the idea from a blog I read about trekking around Malta, and while we definitely stayed on the paths and I think I'd call what we did closer to hiking than trekking, we still had a great time. 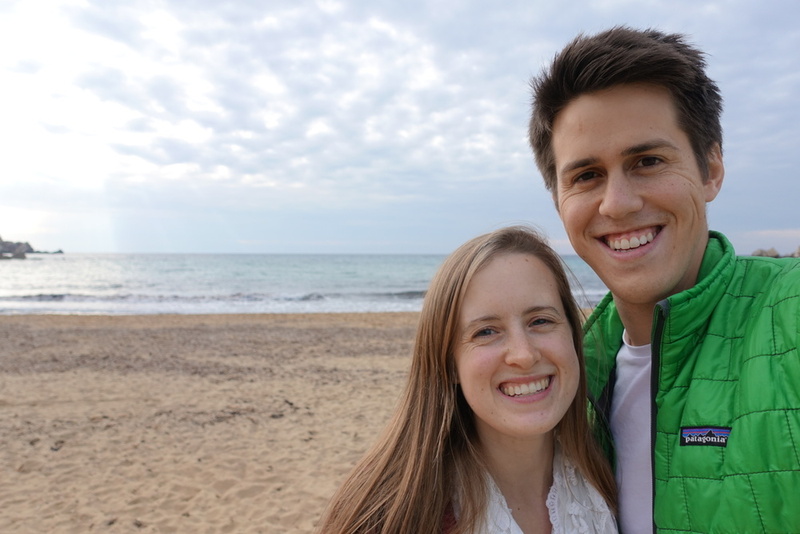 We spent our third day - and New Year's Eve! 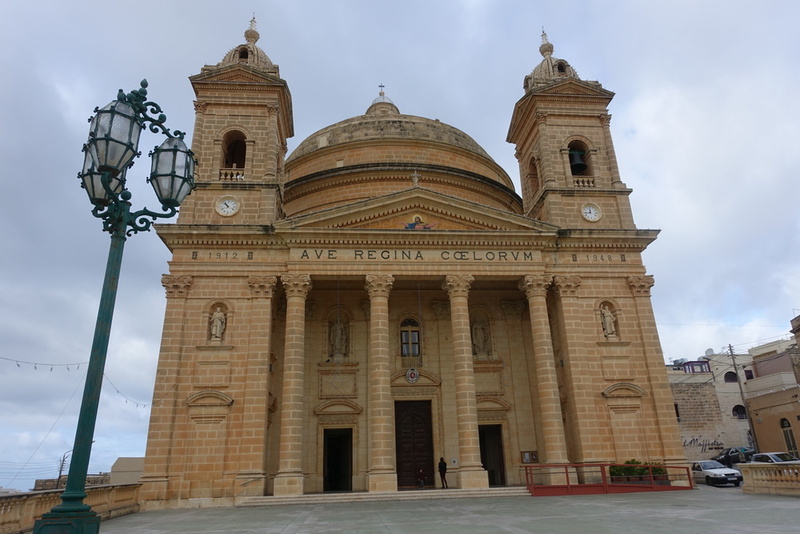 - in Malta on the beautiful island of Gozo (see more here). Our fourth day, Friday, was New Year's Day, and we slept in, made pancakes for breakfast, and after waiting at the bus stop for a while, we found out that the buses weren't running until 3pm. So we went down to the beach for a bit after giving up on the bus. Danny even ran into the (very chilly) sea and came out covered in...trash? paper? We're not really sure what it was, but it definitely required an immediate shower. We're thinking that perhaps whatever was floating around in the water is only present in the winter, as the beaches of Golden Bay seem to be very popular in the summertime. Later in the day we caught a bus to St. Paul's Bay, only about ten minutes away, where we walked around and caught bits of the sunset. 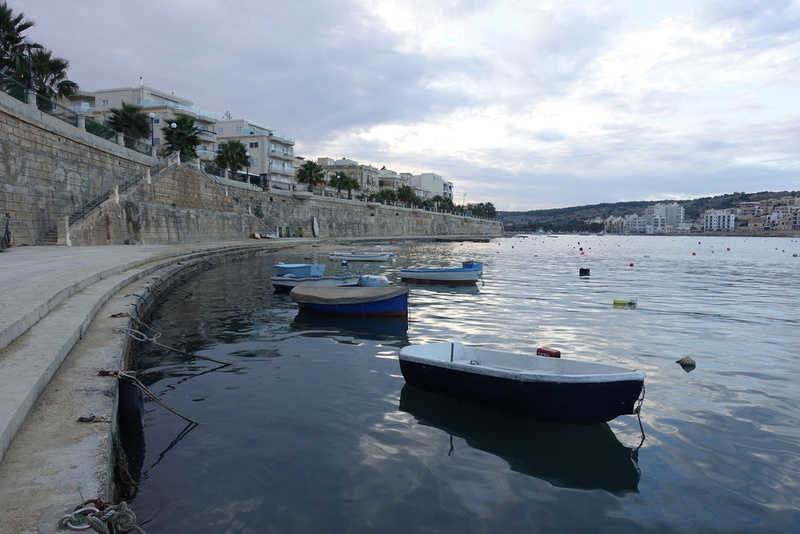 We spent the majority of Saturday, our fifth day in Malta, in Valletta (see more here), learning about Malta's history, involvement in World War II, walking around downtown, and enjoying the Upper Barrakka Gardens. Sunday, January 3rd, was our 3rd wedding anniversary, and we decided to do a walk that we found out about while at the tourist information office the day before. 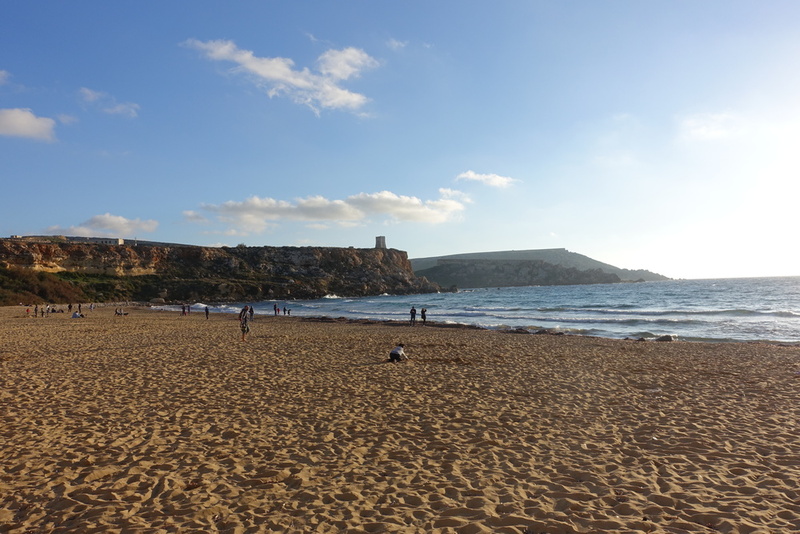 We picked the Watchtowers walk, which starts and ends at Ghadira Bay, Malta's largest sandy beach. For a while at the beginning we were just walking along the side of the highway - no path at all, we were just supposed to walk along the shoulder! - which was a little strange, but it did get better after a few miles. It was supposed to be 14.45km roundtrip (just shy of 9 miles), but we caught a bus back about three-quarters of the way through - the weather was much windier than we might have hoped. 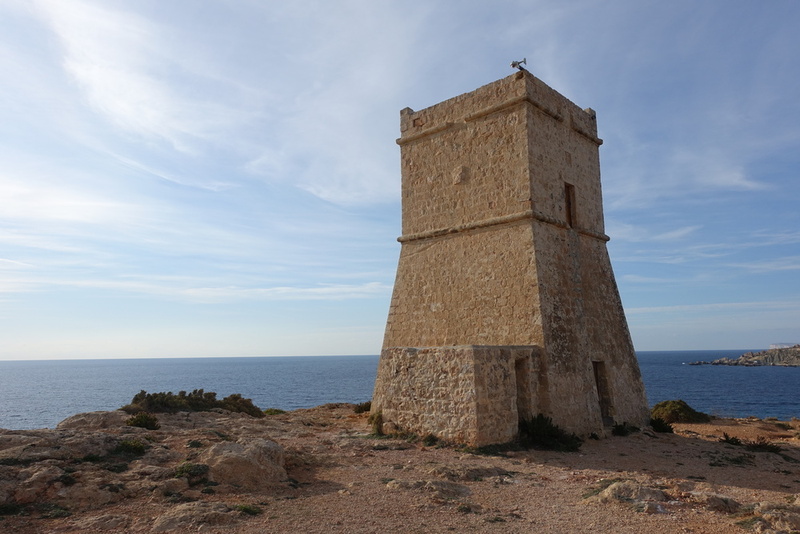 We passed a few watchtowers (as the name indicates), a chapel, saw many different bays and beaches, and walked along the coast at points. I think it would've been a much different experience had the weather been better, but we still had a good time being outside and seeing more of the beautiful island. 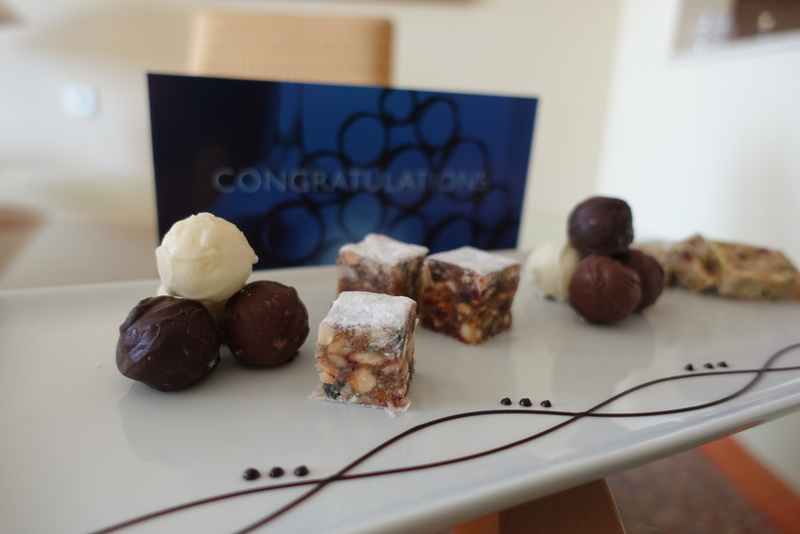 When we got back to the resort in the afternoon, we were surprised with a pretty plate full of treats - Danny had let some of the front desk staff know that we were celebrating our anniversary, in hopes that they might want to celebrate too (they brought chocolates to all the rooms on New Year's! ), and sure enough, they did! We saved most of them for later, though, because we had a date for afternoon tea - thanks to my parents! - another tasty holdover from being occupied by the British for so many years, and even now many British people holiday on Malta (in 2013, 33% of all tourists were from Britain). 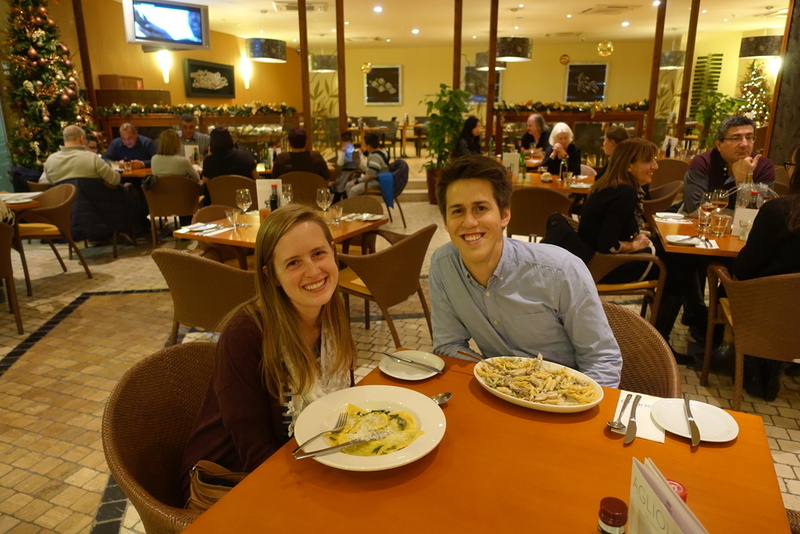 It was our first time to eat at one of the resort's dining establishments, as we cooked all of our own meals in the kitchen in our room, and we found the food to be delicious but the service to be similar to what we've experienced in Spain - unhelpful, slow, and as though we were a bother. I think that's just Europe, though, although I think perhaps we thought it might be different in a place that was catering to tourists, a majority of them English-speaking. Later that evening we had dinner at Agliolio, the resort's Italian restaurant. Our food was great although and we thought it was a little funny when we asked for tap water (as a opposed to bottled water - if you just ask for water with your meal you'll probably get bottles of water so we've learned to be specific) our waitress told us that the tap water wasn't good for drinking in Malta! We were surprised that the resort hadn't told us upon arrival, as we'd been drinking it all week long. We suspect that it was just a ploy to get us to buy the overpriced drinks and bottled water the restaurant was offering, but...we could be wrong. 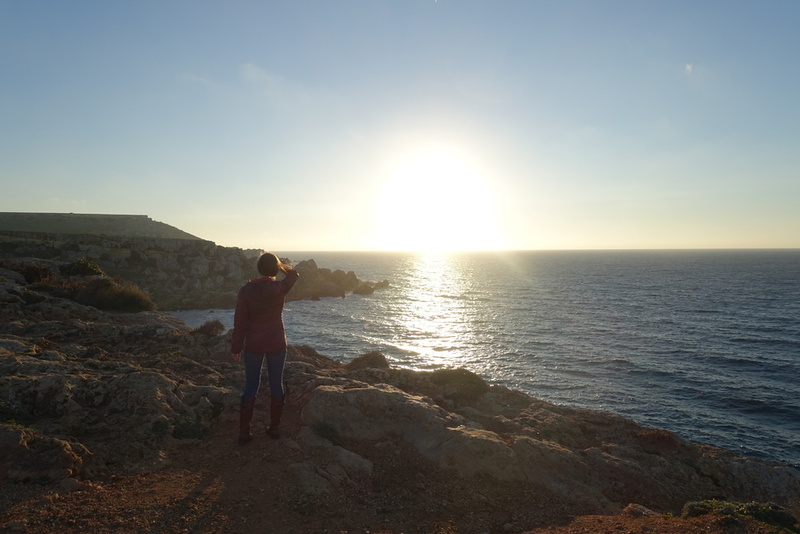 We spent our last day on Malta in the little town of Mdina (check it out here) and packing up and getting organized - it's amazing how spread out you can get in a week! Early the next morning we took a taxi to the airport because we were off to Venice! No more days of wearing one (or no) jacket for us! We went from the warmest week of our trip to the coldest! We had a really great time on Malta. Being able to see and hear the sea every day, taking a break from busy cities, and being able to relax a little bit was really wonderful. We enjoyed exploring a place that almost no one else we know has been. Just one friend we know here in Madrid has been to Malta, and she went just a week before us, plus one friend from the U.S. 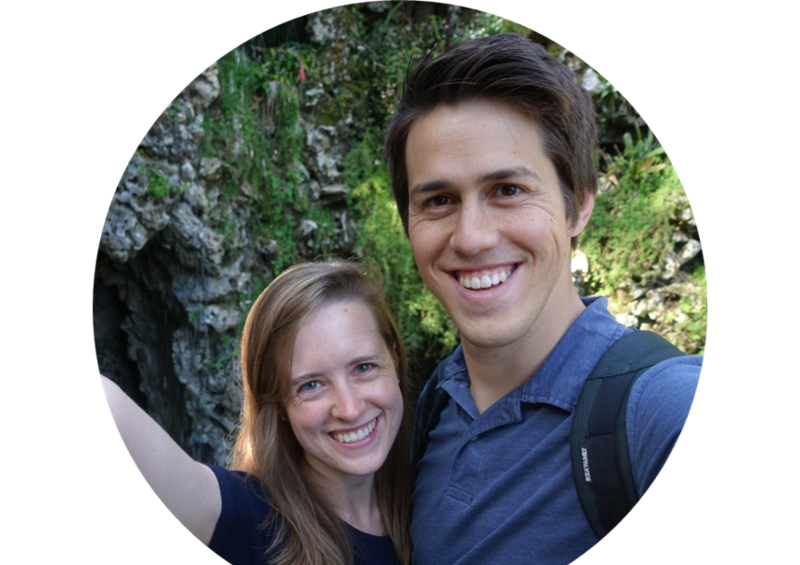 It's no Paris or London - almost everyone we know here in Madrid has been to those places. It was a real change of scenery, change of pace, and change of culture, which we had fun figuring out. Perhaps most all, it was great to be able to settle into one place for a whole week, and not be unpacking and packing up again every few days. The most difficult part for us was the bus system. 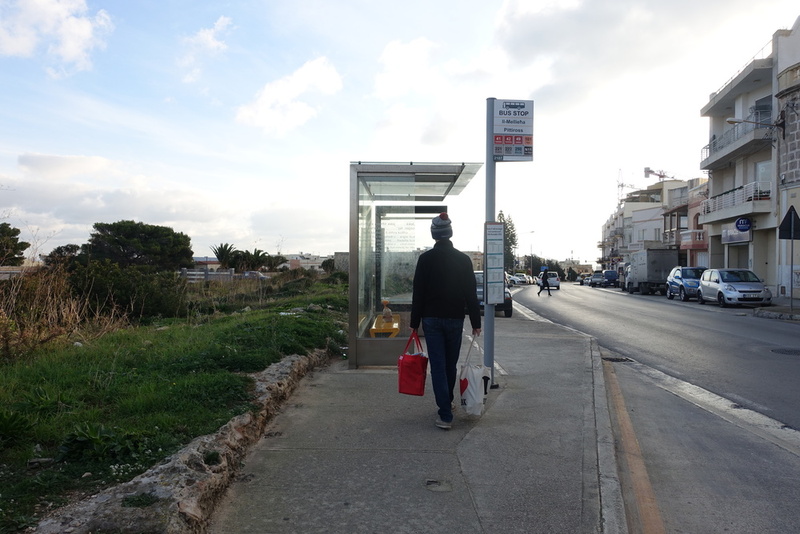 I think I mentioned it when I talked about our time on Gozo, but the buses on Malta seem to rarely run on time. Usually they were late, occasionally they were early, and once in a while they simply didn't show up. 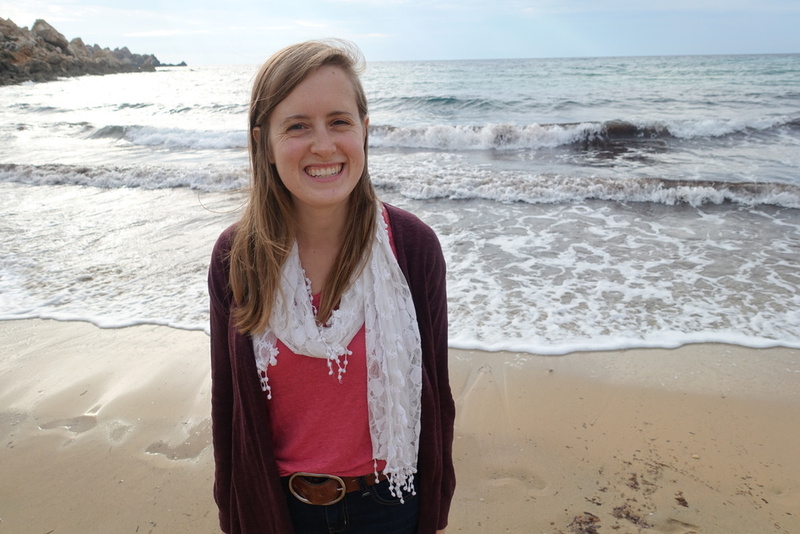 We're used to buses in Madrid running dependably every 5-10 minutes (depending on the bus), so buses that came (unreliably) every 30-90 minutes was a little challenging for us, especially when we were trying to go and do things or make connections. Sometimes a journey that could take 15 minutes by car would take between 45 minutes and 3 hours, depending on which bus(es) you caught (or not). Having a car on Malta is highly recommended. While there is a decent bus system, it's just not all that reliable, so if you're going to use it, be prepared to be flexible and not have a lot of time-sensitive plans. Despite their irregularity, the buses hardly put a damper on our time on Malta. While we waited for them we were in beautiful locations, eagerly looking for the bus that was taking us to our next destination. 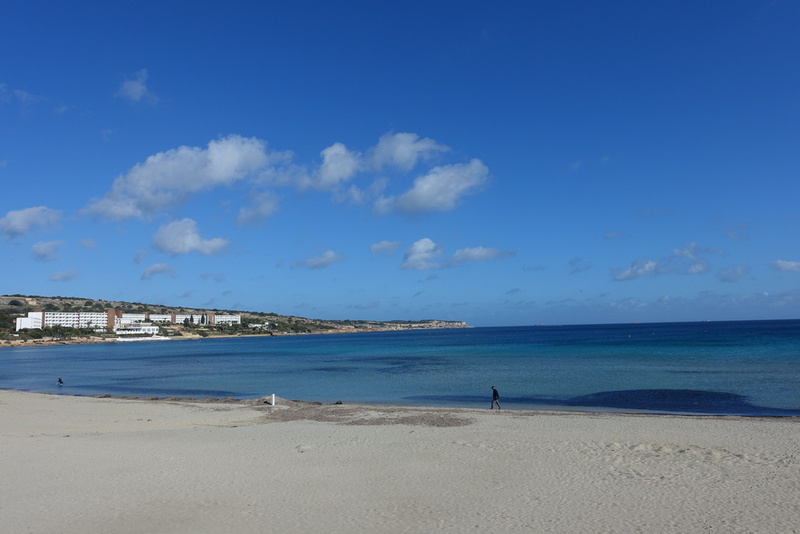 Golden Bay, and Malta as a whole, is a special place. It's not as touristy as much of Europe, but I don't think it will be that way for long. In 2018 Valletta (the capital of the islands) is going to be the European Capital of Culture, which will significantly raise the city's image and profile on an international level, bringing visitors and attention along with the cultural events and regeneration that such an honor brings. 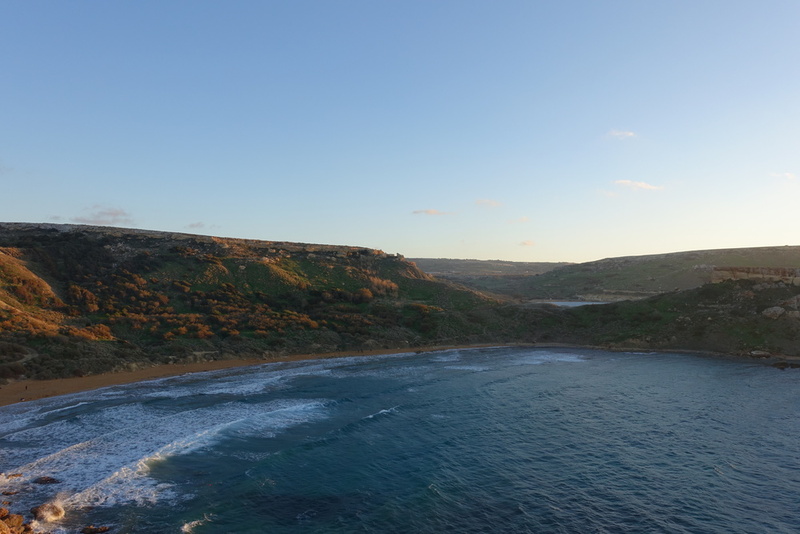 From 2014 to 2015 the number of tourists coming to Malta increased by 6%, so I'd say the secret's getting out. Whether you do it by car or by bus, I'd wholeheartedly recommend a trip to the islands - just make sure you can drive on the left if you do it by car, and you bring a good dose of flexibility if you do it by bus!